An FM-free broadcast tonight; internet only. Live guest Eric Gale postponed until CHSR is back on the airwaves. Ashes, Paper & Beans show tonight started with "episode 3" of the WrimoRadio podcast project of NaNoWriMo (National Novel Writing Month) even though we're in the fourth week and I've still not heard from the media liason for the 18 registered Fredericton participant writers: a 50,000 word novel to be written this month! 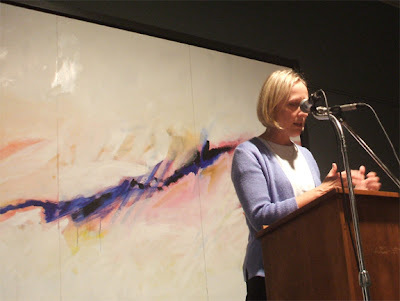 It was followed by John B. Lee's poem "Jimi Hendrix in the Company of Cows" (because today is/was Jimi's birthday); a 1997 reading by Toronto author Carol Malyon and "The Dogs" by Jean Smith. 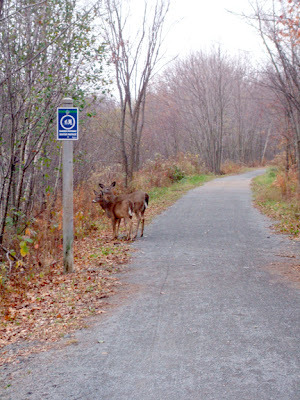 Mixed in was news on readings, craft sales and a play in Fredericton in the coming week. I failed, not miserably at all, but I did buy something on 23 Nov 2007. 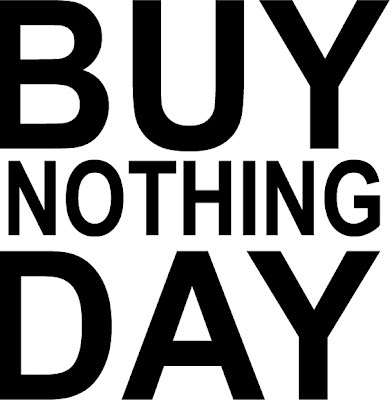 Buy Nothing Day is yet another USA tradition protest or consciousness-raising imported to places were it really means less. First Friday after their Thanksgiving Day. The big day for Macy's and now USA-wide Christmas excess shopping. My only purchases were (1) three happy hour Timberhog Stout (Picaroon's) @ Wilsers while socializing with Beth and Phil and a few peeps they knew, (2) a slice of "works" pizza @ Luna, (3) a bottle of cheap red @ anbl. No major electronics or entertainment systems. No shop till I drop. Sheri-D Wilson & Russell Broom with "Snap Shot". Guest: author M. T. Dohaney discussed her latest novel, The Flannigans (Penneywell Books). Drek Daa with "Isles of Grass", "Omaha Poetry", "There and Then". WriMo Radio 2007, episode 1, from National Novel Writing Month. Sheri-D Wilson with "I am a Closet New Yorker". Expose your art, expose yourself, and help support Fredericton’s only artist-run center! 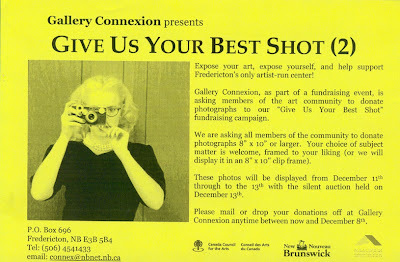 Gallery Connexion, as part of a fundraising event, is asking members of the art community to donate photographs to our “Give Us Your Best Shot” fundraising campaign. We are asking all members of the community to donate photographs 8” x 10” or larger. Your choice of subject matter is welcome, framed to your liking (or we will display it in an 8" x 10" clip frame). These photos will be displayed from December 11th through to the 13th with the silent auction held on December 13th. Please mail or drop your donations off at Gallery Connexion anytime between now and December 8th. Had to SOCAN log tonight's show even though I thought that Ashes, Paper & Beans only rebroadcasts once during the next SOCAN monitoring @ CHSR: 21-24 November. Whatever. 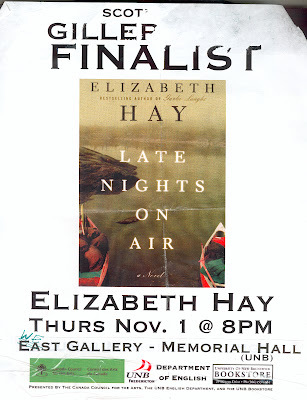 First half of show was my recording of Elizabeth Hay reading from Late Nights on Air (Harper Canada)—last week's announced winner of the 2007 Scotiabank Giller Prize. Second half was part one from my recording of the Side by Side Festival of Literary Translation / Côte à Côte festival de traduction littéraire Roundtable / table rounde on /sur Endangered Languages. End piece was the short "The Green" by Dasez Scott from the Word Up spoken word CD (Virgin/EMI, 1995). T: 100 Mile House, B.C. Found 11:50 AM in the nave of the deconsecrated St John Anglican Church on Highway 105, Whites Cove, NB. 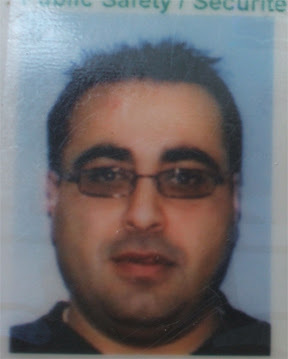 More than just a found photo this time, I found a wallet with driver's licence, business cards, receipts, Blockbuster card and more . . . but no money. Found on Rememberance Day, Sunday, 11 November 2007 at 11:50 AM under a bush, a shrubbery, outside the home of Ross Leckie at the intersection of St John Street with Churchill Row, Fredericton, NB while I on on my venue-confused walkabout route to the noon screening at the Charlotte Street Arts Centre of documentary films in the Silver Wave Film Festival. En route to Silver Wave's 7 pm Gala Closing screening @ the Tilley Hall Auditorium, I went by the nearby Church Street address on the driver's licence and George was still living there (with his wife and children). He was very grateful. Had had the wallet stolen from his truck on Thursday night and, long weekend and all, hadn't yet started replacing his ID. Good timing on my part. Ashes, Paper & Beans: Fredericton's Writing & Art Show with host Joe Blades. CHSR 97.9 FM, Fredericton, NB. 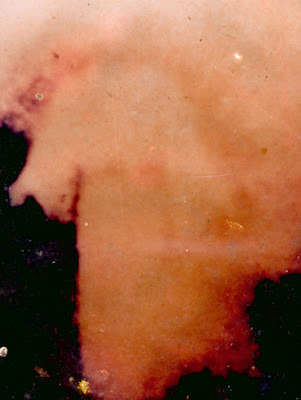 Tonight's show started with "Martin Scorcese (PG-13)" by King Missile. 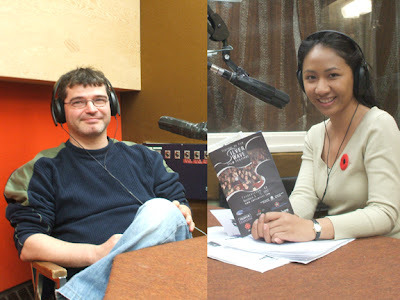 The feature was a lively interview-discussion with two guests: NB filmmakers Bunthivy Nou and Dennis Poirier, both on the board of the New Brunswick Filmmakers’ Cooperative and involved in several film productions screening in the 2007 Silver Wave Film Festival that opens Thursday, 8 Nov at 7 pm at the Charlotte Street Arts Centre Auditorium. Show ended with "The X is Black (Spike Lie)" by Amiri Baraka. shirt: OAKLEY, Hfx NS, Guaranteed to blow your socks off! 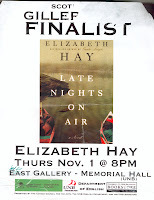 Alumni Lounge venue became East Gallery, UNB Art Centre, but upon arrival it was evident the the new "east" was West. I set up my mic and recording deck in semi-darkness afore Marie arrive to jig the lights. Late Nights On Air (Harper Canada) is essentially a story of the small crew-community within a small radio station in Yellowknife. One somewhat based upon some of the author's personal experience in the North and in radio and so much more. Read a great party scene against a backdrop of art by Fredericton painter Angel Gómes from his exhibition Andadura: New Work / Retrospective scheduled to open at 5 pm this coming Friday, 9 November.